Secure Empty Trash Makes your deleted files are difficult to recover. When you empty the trash to remove files and folders from your Mac Trash bin, they may appear gone but that is not the case all that deleted files, pictures and videos etc,. are still on your hard drive. Deleting files (empty trash) only tells your Mac OS X to overwrite the hard drive space deleted data still occupies, that means until deleted data is written over by new data all the original data is still there and clearly visible to any basic data recovery disc. If you want to make sure that your deleted files can not be easily recovered, always use the Secure Empty Trash option instead of just Empty Trash. 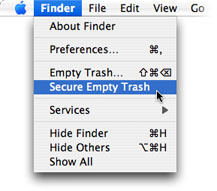 Go to Finder scroll down past Empty Trash and click on Secure Empty Trash instead. Secure Empty Trash makes your deleted files very difficult to recover. If you : Secure Empty Trash everything that is currently in your Trash will be overwritten with random data, making any deleted files very difficult to recover and decipher, (but not impossible) Secure Empty Trash is a good step more than useful when you want to permanently delete old personal records, photographs and videos etc some of which could potentially be used to steal your identity or worse. To further enhance the deleting process with Mac OS X you can also Zero Out Deleted Files. How to Zero Out Deleted Files, go to Go, then go to Applications, go to and open Disk Utility, click on Erase, then click Erase Free Space, and finally select Zero Out Deleted Files. You can go a bit further here at this stage if you feel the need you can select 7-Pass Erase of Deleted Files or 35-Pass Erase of Deleted Files, however, you will need a bit of time on your hands because it’s a long process. Zero Out Deleted Files is much quicker and pretty reassuring especially if you have already Secure Emptied the Trash. Also under Finder Preferences, under Advanced, you can tick the (Empty Trash securely) box, that way every time you empty the trash OS X will slowly but surely, Secure Empty the Trash bin for you. Please don’t think any of this as the ultimate in privacy protection, security measures in use today will not be adequate in the future as new security technologies are developed. The best thing to do, if you are looking for safe High Security Storage for sensitive and valuable information, banking and confidential details etc,. is to only use a Hard-Wired External Remote Hard-Drive Storage-Device, connected to your computer via a USB Plug and have the Hard Drive located well away from your computer, locked away in a Safe preferably with a small hole drilled in the side for the Hard-wired cabling, or better still have it hidden under the flood boarding or buried behind brickwork, whatever you do make absolutely certain someone unscrupulous can not get their hands on your Hard-Drive because, no matter how well you secure lock your hard drive data, some of that data can still be professionally extracted if your hard-drive should end up on a professionals work bench, and of course make absolutely certain you do Secure Lock all Hard-drive Data/Files, because if you don’t and that same someone stumbles upon your Hard-drive USB plug all your Files/Data will be open and freely available. Always regularly Zero Out deleted files. Always use a Hard-Wired storage-device. Always Lock your storage-device Data/Files. Always hide Storage-Devices in a safe secure place. Always use External Remote Hard-Drive storage devices. Confidence with hard wired data storage systems is much higher, perceived as more secure then radio for sensitive data. We would agree for safe high security storage of sensitive and valuable information, banking and confidential details of this type. It’s probably best not to have the additional worry of data interception with a radio connection, and use instead a hard wired connection for peace of mind. Western Digital (below) is ideal for this because, for your peace of mind it can be plugged directly into your computer to eliminate all fears from radio transmission. This High Security Storage unit from Western Digital is ideal for home or office, with a huge 3T-Byte Wire-free or Hard-wired connection, this unit is extremely versatile and safe. Basically this product a 3000 Gigabyte hard drive, but instead of just plugging it into your computer, you can now also plug it into your router. Then you have a 3TB Wi-Fi H-Drive for every computer in your home or office can use it for absolutely anything, it can be a place to store music, films, photos and you can access all this data from multiple Mac’s or PC’s within range or remotely On-Line from anywhere in the world. This entry was posted in money and tagged Secure Empty Trash. Bookmark the permalink. Post a comment or leave a trackback: Trackback URL.